Thigh liposuction, sculpting and contouring is one of Dr. Neinstein’s favorite procedures. Our practice has a unique approach to sculpting the thighs after doing hundreds of these thigh liposuction procedures. Dr. Neinstein focuses on the inner thigh, outer thigh and knee area. We have found that the anterior and posterior thigh areas provide significant structure to the leg which means when liposuction is performed here in many cases the area becomes destabilized and the skin becomes loose and falls over the knee which can be very unsightly. For the inner thigh or the thigh gap, Dr. Neinstein uses very gentle melting and tightening devices and custom designed curve cannulas that are very small. 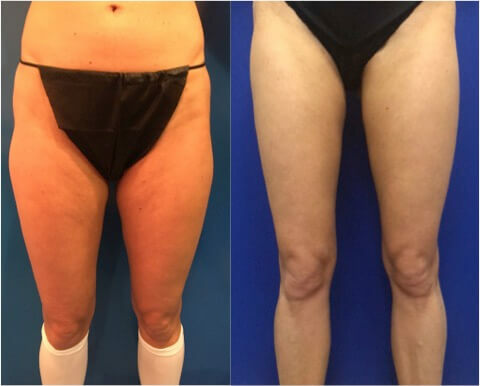 Dr. Neinstein also enters from the front and the back as we see many of patients who have been just operated on in the front and have a significant amount of fat in the back which really bothers them and does not allow for a sculpted inner thigh that matches the rest of the leg. Thigh liposuction is interesting because it is one of the most common areas of liposuction performed yet I think it is the worse area executed by surgeons. This is because the anatomy of the thigh is complex and difficult to manipulate. The upper inner thigh tends to have very thin, loose skin for many patients both men and women. The fat underneath that loose actually provides structure to the overlying skin. In many instances in the office, I see surgeons took too much fat out of the upper thigh without addressing the skin issue. The result is loose hanging skin and a divot or shark bite. When I analyze the inner thigh I look at it from the front and the back. Another aspect of inner thigh liposuction I notice is that most surgeons only work from the front. While it is definitely easier to only work from the front the upper inner thigh is a dynamic upside down cone and true sculpting requires a posterior in the buttock crease incision. While this may take more time it dramatically increases the results for the patient. Patients commonly seek “thigh gap” or more recently “toblerone” gaps. In many patients we can achieve this but not in everyone. I would say we don’t end up doing the inner thigh in about 30% of patients who seek it because I do not think they will have a nice result without skin removal. From time to time we will do a small crescent or half moon or banana skin excision in combination with liposuction of the inner thigh. This is the equivalent of my mini arm lift in the thigh. When we do use energy devices in the inner thigh we also have to remember to use less energy. I use Vaser and Plasma on almost all cases to ensure the best results but the inner thigh skin being very thin is much more susceptible to injury from energy. I teach Vaser and Plasma liposuction and review many medical legal cases of liposuction complications and the one thing I see over and over is excessive energy use in the inner thigh. The inner thigh skin can tolerate approximately 30% of the energy of the abdominal skin. What I try to teach to the surgeons who visit me is that you are still giving the patient 100% results its just that the skin is so thin that it needs less energy to get the results so don’t feel like you are short changing the patient. If we just treat the upper inner thigh we have patients in garments above the knee for two weeks. If we perform micro knee liposuction and sculpting we will have the garment go past the knee. Patients walk the same day, resume social activities in 48 hours and can exercise in 3 weeks.